Sometimes we just all need a night in with friends, lots of chocolate, movies and a good old pamper. For those weekends when you fancy some time out with your mates and a girly night in, I thought I'd share with you my girls night in essentials! ♥ First of all you need to make a cute cosy area where you can all sit and chill out. 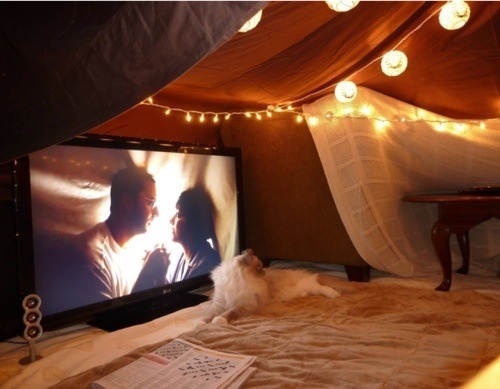 I'm a child at heart and love making a cosy den! Whether it's a makeshift cosy area of the living room or you just make your bedroom look cute, get your fairy lights out and let your imagination run wild! ♥ Make sure you've got lots of fluffy pillows and blankets ready! ♥ Next you all need some cosy pj's and fluffy slippers. ♥ You need to decide on whether you're going to get out a bottle of wine or go for a cup of tea and then get some tasty treats to accompany your drinks! I love getting lots of chocolate or crisps for a girly night in! It's always a good option to pig out and go for a take-away too! ♥ It's a good idea to decide on some girly movies to watch while you pamper yourself. Some of my favourites are Love Actually (at Christmas time), The Notebook and Bridesmaids! ♥ It's important to decide what pamper treatments you'll be giving yourselves. I always love to get out my nail polishes and have options for people to choose from. I make sure I've got a face mask to put on and then get cosy ready to watch the movie. So there we have it, there's my essentials for a girls night in! What are your essentials for a pamper evening/girls night in? Let me know in the comments!